THESE FLH Frame stabilizers are CNC-machined from 6061-T6 aluminum. Use them to improve handling by trangulate motor & transmisson in the chassis to eliminate frame wobble at high speeds and while cornering. STOP the weaving, wiggling, wobbling and the rear steer. Designed for years 1993-2008 FLH, and also years 2009-2014 FLH models, Our Track-True uses a swingarm pivot anchor. We also keep in mind the heat factor under the transmission with air holes to let the heat out. 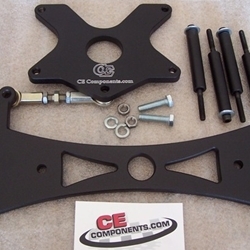 This kit doesn't hang below the frame keeping all of the ground clearance.